Hi everyone! Today I have a super exciting post for you! You may know that one of my favourite indie brands is/was Paint Box Polish. Well Pam behind Paint Box Polish decided to rebrand and Paint Box Polish has now become STELLA CHROMA. New name, new image and new site but the same great polishes! You'll find all the useful links and info at the bottom of this post along with some info about the launch giveaway being held! This is the first collection from STELLA CHROMA. The Premier Collection is made up of 3 polishes, Savvy, Grit and Hustle. So let's get to it! Here are my swatches! 2 coats plus topcoat. Absolutely nothing to say about the formula except that it was perfection. I'm not even obsessed with holo polishes but I fell in love with this one and already want to wear it again! 2 coats plus topcoat. Another fabulous formula. I'm a huge purple fan so this one is love for me. I don't have any other polish like it in my collection. I love the golden flecks against the purple base. The sheen on this polish in sunlight is stunning. I also took pics in the shade so you can really see how the golden flakes stand out. 2 coats plus topcoat. Another great formula and unique polish. I love all of Pam's polishes with flakes, she does them so well. These multichrome ones pop against the base colour and catch the light beautifully. The pink base really glows! I absolutely love the whole STELLA CHROMA image. The labels and cards feel luxurious and very 'boutique'. I couldn't resist creating some nail art inspired by the cards and STELLA CHROMA logo. I did a smoosh marble using Grit and some Paint Box Polishes from before the rebrand. I used What 'Choo Fell Over For?, Blue Above The Bay, Won't The Muggles See Us? to mimic the watercolours on the card. I applied dots of each colour onto my stamper and 'smooshed' it onto my nails. I then finished with topcoat. I then decided to add the cute little stars from the logo afterwards onto my middle fingernail with some gold polish. I used an old Konad stamping plate with tiny star designs. One of the big changes that will come with STELLA CHROMA is charity! Pam is a Nurse Practitioner by day and has nieces that are very interested in the sciences. For those reasons, promoting STEM careers to girls is near and dear to her heart. Stella Chroma will be partnering with a different organis ation each quarter and donating a portion of sales. The first one is IGNITE (Inspiring Girls Now In Technology Evolution), which is a non-profit that introduces girls in grades 6-12 to technology and engineering careers via various programs in partnership with their schools. More information can be found at their website! A giveaway is being held to celebrate the rebrand and launch of STELLA CHROMA! 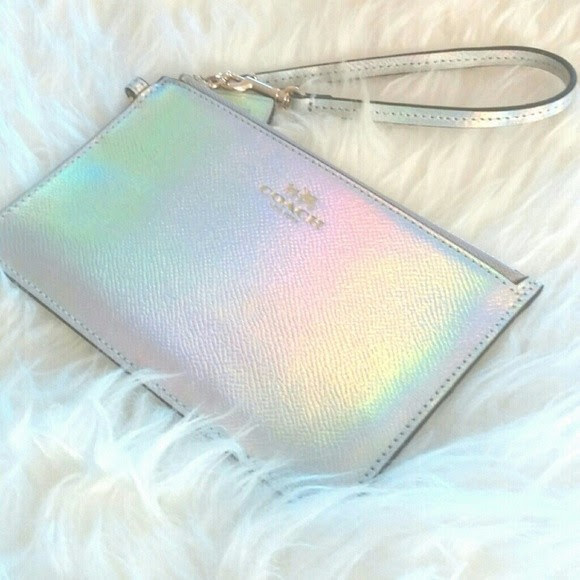 The prize is a Coach holographic wristlet. Making a purchase in the first week of the shop being open counts as an entry. If a customer adds a note to their order stating that a certain person sent them to the site to make that order, the customer and the person will get another entry. 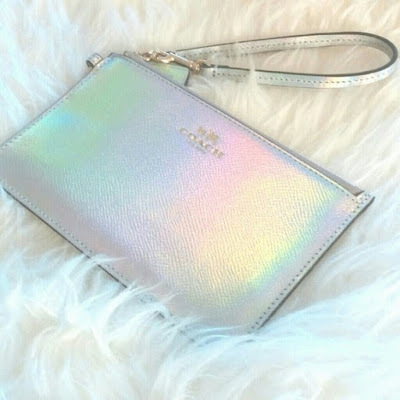 STELLA CHROMA will mail the wristlet to the winner! This collection is so exciting and I can't wait to see what is in store from Pam. The Premier Collection and the STELLA CHROMA brand are launching on June 29th. I also wanted to remind you again about the Paint Box Polish fan group on Facebook called stella chromatics (which I co-admin). We’d love to have you join if you haven’t already! Hi everyone! Today I have a simple but really pretty mani to show you that I wore a little while ago when I needed to hurry! I started out with two coats of OPI I Brake for Manicures. I absolutely love this greyed out dusky plum/brown. I say plum/brown because a lot of swatches I saw of it seem more purple but this really does pull more brown on me than in the bottle. Strange but I love it anyway! Definitely a go-to OPI creme for me. OPI I Brake for Manicures & Designer...De Better! I wanted some nail art but didn't have time for much so I settled on some dots of various sizes at the base of my nails using OPI Designer...De Better! from the Holiday 2011 Muppets collection which is a silver foil with specks of bronze. I really love this shade and was so happy to finally buy it from a friend after kicking myself for not getting it when it released. I finished my nail art with topcoat as always. I really enjoyed wearing this mani and it felt done and nice while being quick and quite neutral if that makes sense. What do you think of it? Are you a fan of dotticures? They're my go-to for a quick nail art!